Family Friendly Lakefront Property- Day by Day Rates Available! 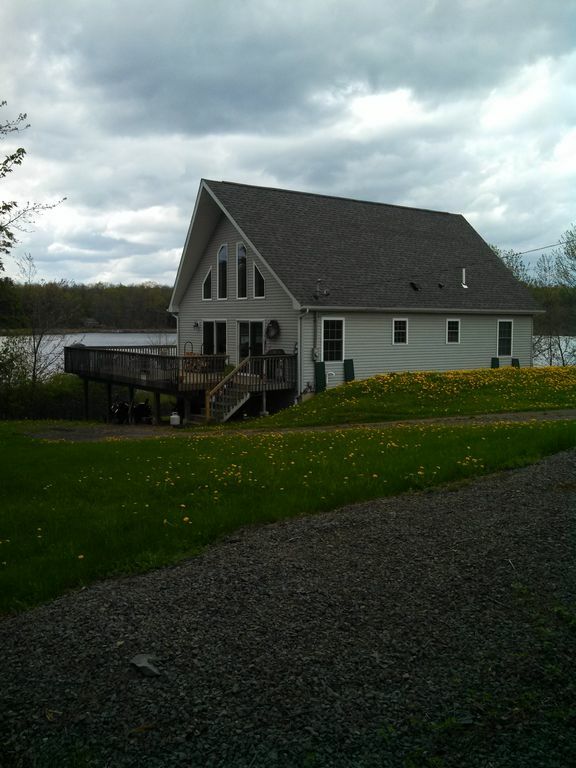 3 Br 2 Ba On Water's Edge! Waited too long to book? Email me - we can do this! Lovely Chalet with 2 BR's down and one sweet loft BR. One full bath down, and one full bath up. Great for two couples or those with kids. One room is set up as kids room...toys and Disney tapes (yes tapes) included for their own viewing - twin beds for kids. Pleasant living room with piano for your use. Relax by the windows facing the lake and enjoy a good book. Extra clean, modern, reclusive and peaceful. Open views to the lake and wrap around deck. Stay here and fish, kayak, canoe, read, hike and veg out...or visit the amenities surrounding. Boating (kayak or canoe) 'mini lesson' are available for those who would like - my friend is a water safety instructor. Full gear for boating, poles for fishing...just find or buy the worms! Floating dock in summer for swimmers. Rarely anyone on the lake...except us! Come and enjoy. For the past 20 years, I have bought, fixed up, lived in, and sold beautiful Victorian homes and 'city' houses so that I can work my way to my perfect home on water. This is the perfect home. As an environmental educator, this home epitomizes what a pure and natural home should be. With the freshwater lake biome, and the peaceful surroundings...it doesn't get any better than this! Water. Boating and kayaking has always been my thing. I built and raced cedar strip canoes back in the 80's...now I am into the calm and peace of kayaking. It is all good. I spotted this home from the other side of the lake. It was sitting there, empty, alone...and it cried out to me and said...'Here I am...I am the home you waited for!' And, it was right. I spent 2 months before buying just sitting on the deck every night to watch the sunsets and the fish jump. To watch the beavers, the heron, the eagles, the hawks, the ducks and the geese. There is so much life here, and so much pleasure, you will not want to leave. 30 acre lake with north and south end nature preserves. Kayaking, canoeing, swimming, fishing. And many beautiful sunsets. Electric heat in every room if needed. And...a solar dryer as well (clothesline)! Mi-fi. Please read the binder on table with regard to re-set if needed. Not necessary to use in the summer. If for some reason you do, please call me ahead of time. Seats 6 now...add a leaf...seats 8. Smaller round table nearby seats 4 or more if leaves are put in. Please read the binder on table with regard to remotes. We supply boats. We will also teach you how to kayak/canoe if you need us! If you can get the chair up the 6 deck steps...then it is wheelchair accessible. The rooms are open and spacey...bathroom door won't fit chair in but sleeping and bath and decks are all on one floor. Easy if you can help one walk...just a little. Sunsets are amazing. What an amazing property, wish I could have stayed longer. So relaxing to sit on the deck in the morning and sip coffee while staring at the lake. I took my wife and kids out on the lake in the provided canoes and kayaks. I also showed my daughters how to fish and caught a couple of catfish (of course we released them back) but what a great experience. It’s beautiful at night on the deck staring up at the many stars that we miss seeing in the city. Really what a wonderful relaxing stay. House was beautiful! We enjoyed the kayaks and fishing on the lake! We would definitely return! So glad you enjoyed it!!! Come back again next year! Place was very clean and kitchen well stocked. House had a very welcoming feeling. Really enjoyed the view from the deck and the privacy and relaxation we felt there. Lovely stay at this property. Very spacious and clean. Boys enjoyed kayaking and fishing. Very tranquil area. Neighbors were great and allowed us to use their docks due to the dock on the property is surrounded by a ton lily pads so it made it really hard to fish from. The view from the balcony was pretty however you had to look at it from around a tree that was growing right in front of the deck. The deck is very large and spacious. The only thing I would recommend would be a patio umbrella for some shade. Overall a nice stay. Family had a great time. Weather was perfect and house was nice. Loved waking up in the morning and going for a paddle around the lake. We were looking for a place to relax and get away from it all. We found it. See guide for local things to do. From down-hill skiing, skating, x-country skiing on rails to trails, to ice fishing in the cool weather (and wonderful restaurants to eat out!) to fishing, swimming, boating, hiking, and viewing the Endless Mountains region with wonderful drives in the warm weather. This home is a "good-earth" home. Living next to the water's edge requires caring environmental stewardship in order to keep our lake and land pristine. This is one of the last glacier-bogs in Pa., and a healthy lake biome full of wonderful fish and pleasures. Please leave only footprints behind.